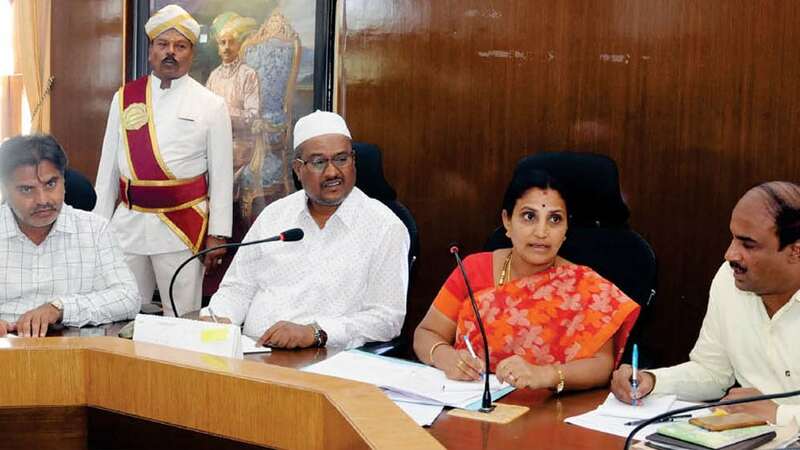 Mysuru: A Probe Committee constituted by Mysore City Corporation (MCC) headed by Mayor Pushpalatha Jagannath in connection with MG Road Double Billing Scam where Rs.1.4 crore was reportedly siphoned off by submitting two bills for the same work, held its first meeting at MCC Council Hall this morning. It may be recalled here that MCC had constituted this Committee on Feb.6 comprising MCC Council Secretary R. Rangaswamy as its member secretary. While Deputy Mayor Shafi Ahamed, PWD Superintending Engineer K.V. Prakash, MCC Works Standing Committee Chairperson Lakshmi, Ruling Party leader H.M. Shanthakumari, MCC members Ayub Khan, Prema of Janata Dal (Secular), Ward 47 Corporator Shivakumar, Ward 55 Corporator M.V. Ramprasad as members of the Committee. The MCC had constituted this Committee as the leader of Opposition B.V. Manjunath raised allegations over this issue at the MCC Council meeting held on Jan.30 and demanded a detailed probe in this regard. .
Probe Committee Chairperson Mayor Pushpalatha Jagannath holding the first meeting at Mysuru City Corporation (MCC) Council Hall in city this morning. MCC Council Secretary R. Rangaswamy, Deputy Mayor Shafi Ahamed, Former Mayor Ayub Khan, MCC Opposition leader B.V. Manjunath others look on. Today, the probe Committee held its first meeting in presence of complainant B.V. Manjunath and MCC Assistant Executive Engineer Sunil Babu, MCC Zone 1 Office Junior Engineer M.N. Mohanakumari and contractor Karigowda who are in the dock for alleged misappropriation. Manjunath presented photos, papers, videos, details of grants received by the government, other documents and records related to the scam to defend his allegations before the Committee. At the same time, the Committee had also collected the details and other records from the accused. The meeting will discuss this issue threadbare till this evening according to sources. The Committee is expected to present this report in the next Council meeting and a final decision to recommend the action against the alleged guilty officers will be taken only after this meeting. The Committee can only recommend action against the guilty to the government and it has no punitive powers. Senior officials of MCC led by Executive Engineer Ramakrishna had inspected the MG Road recently from District Court Complex to Siddappa Square focussing on the asphalting work, covering the length and width of asphalted portion, quantity of materials used, equipment used for the job and the quality of the asphalt. They also examined median parameters and concrete blocks used for the purpose and collected information meticulously and methodically documented them.